As a teenager, my favourite thing to order off of any menu was the classic chicken tenders and fries. It didn’t matter which restaurant I was at, I wanted to try those juicy strips. My friends would make so much fun of me, as they could always guess what my order would be. Now fast forward 15 years later, and here I am making my very own baked crispy chicken strips. It is just so much more rewarding making homemade versions of your favourite recipes. And to top it off, making them healthier. Now that feeling is in a category of its own! Since the majority of restaurant-ordered chicken strips are deep fried, the fact that this version is baked makes it a zillion times healthier for you. It is also healthier because we know exactly what we are adding into the bread mixture. I mean, just look at the ingredients. There is nothing outrageously bad for you in this recipe. So you know exactly what you are coating these bad boys with. 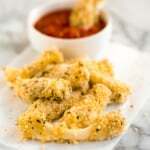 A lot of chicken strips tend to include a big-sized serving of Parmesan cheese in their breaded crumbs… bet you didn’t know that! 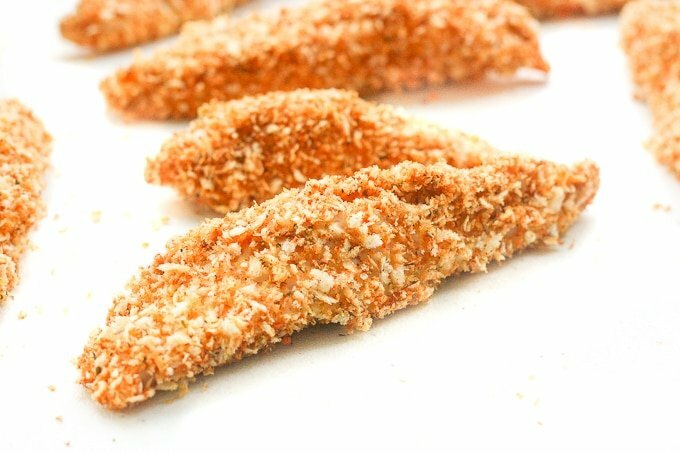 For those of you that don’t know, in the world of breaded chicken, there are breadcrumbs and then there are planko breadcrumbs. 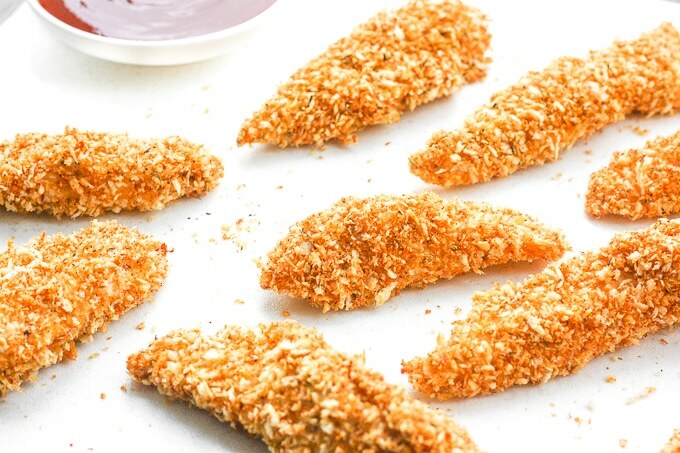 Planko breadcrumbs are a Japanese-style breadcrumb with a jagged coarse texture that gets super crispy without having to be deep-fried, hence why they make the perfect coat for baked chicken strips. I found them in the “International” aisle of my local grocery store. You can also find them at any specialty Asian supermarket. Although, my restaurant activities have changed immensely from when I was a young teenager, and I now like to try new and more intricate dishes on the menu, I can still appreciate a batch of good old-fashioned chicken strips. I particularly consume them when I am at a baseball game or hosting game day at our home. It is the perfect appetizer to munch on while cheering on your favourite team. Pair this with a side of your favourite dipping sauce (mine is barbecue sauce) and watch it disappear right before your eyes! 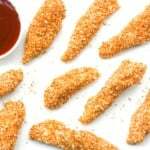 Juicy long strips of chicken shaped perfectly for dipping and coated with a flawless crispy and crunchy exterior, baked crispy chicken strips are a pleaser. Preheat your oven to 400 F. Line a cooking pan with aluminum foil and spray with cooking oil or brush with oil. In a frying pan, heat olive oil over medium heat. Add the panko breadcrumbs and cook for 2-3 minutes while stirring continuously until the breadcrumbs start to brown. Be careful not to burn them, you only want them to slightly turn a golden colour. Remove from heat and mix in the italian seasoning blend, paprika, salt and pepper. Toss to combine. Set aside. In a bowl, beat your egg. Add the mayonnaise and continue to beat. Pour into a shallow dish. In another shallow dish, add the flour. Now, start coating your chicken strips. First, dip the chicken into the flour and fully coat it. Next, dip it into the egg mixture and fully coat. Lastly, place your chicken into the panko breadcrumb mixture and coat fully. Place the coated chicken strip onto your cooking tray. Continue for all pieces. Bake the strips for 15-18 minutes, until the chicken is no longer pink inside. Serve immediately with a side of your favourite dipping sauce. Made these for lunch for me and my 1-year-old daughter. Phenomenal! Best crispy chicken recipe I’ve ever tried. Thanks for sharing! 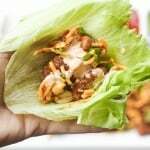 Love this recipe, and so did my family! Can you make these ahead, freeze them and rebake them successfully? I would love to make up a huge batch to have some in hand for when I work late. Thanks! So glad you all liked the recipe! I have never tried freezing them, but I don’t see why not. Just store the prepped and uncooked chicken in ziploc bags and then cook from frozen as desired. Note that you would need to adjust the cook time when baking from frozen. These came out beautifully crunchy and so moist! 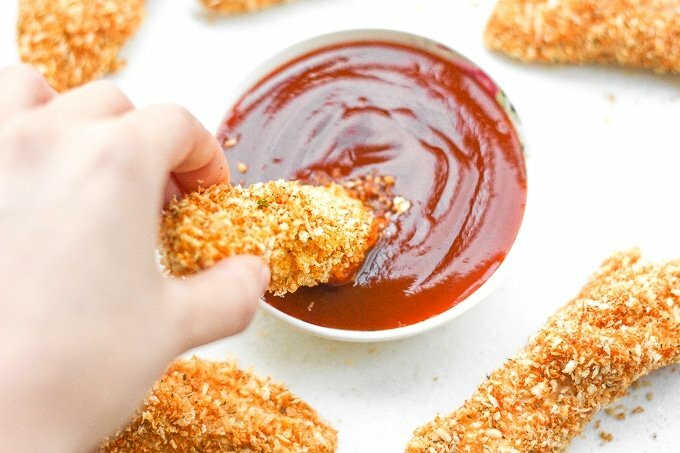 Best baked chicken tender recipe I’ve come across! I actually served them in a wrap with homemade chunky avocado salsa. Delicious! 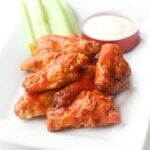 I did not think it could be so easy to make chicken strips at home without a deep fryer! These strips turned out so good! These sound really nice. Thanks for sharing this. These theare my favorite receipe for chicken. Not just strips but chicken. 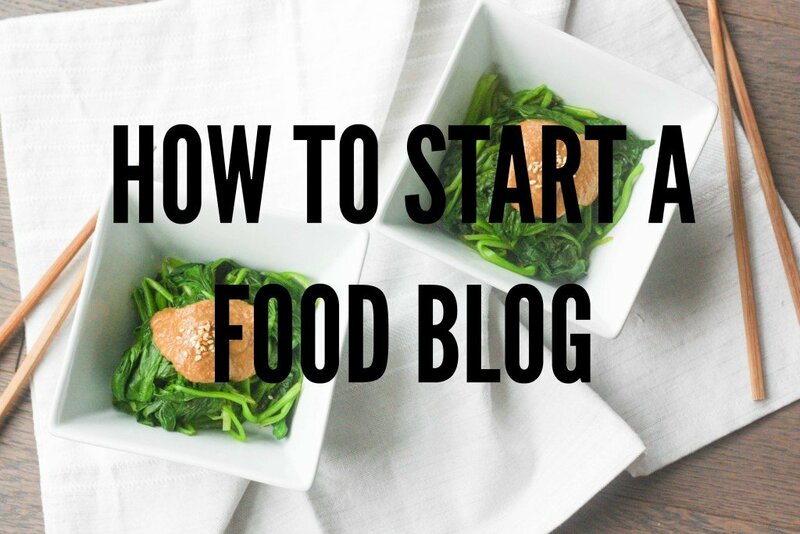 I make it every Sunday and it serves as an easy lunch and dinner go to. Whenever I leave out of town I make it for my honey so he has no worries. These look so delicious! I was also the teenager who wanted chicken strips everywhere. Texas Roadhouse especially. Great looking chicken strips. My kids will love this. We use panko crumbs as well, so versatile. 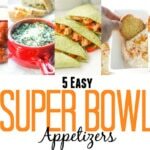 These look like a great dinner option for my family! We love baked chicken! I love using panko. I haven’t had chicken strips in long while, but I think that may change in the very near future! Oh these look delicious Sam. I bet they’d be great with a salad for a light dinner. Lovely photos too. Thanks, Georgina! Oh absolutely, they would be perfect on a caesar salad or a garden salad! Sometimes you just need that finger food… but yeah, I rarely want to deep fry things at home for so many reasons… This baked version looks good. Oh my goodness these look incredible! I love chicken strips. Have you ever tried adding almond meal to your breading? I’ve done it for chicken nuggets before and it turned out well! My son and whole family will love this. I LOVE adding paprika to this sort of crust. Delicious! This is a great recipe for my family as we continue to bake chicken more. Pinned! 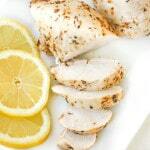 Chicken strips are still a favorite of mine – love your healthier version! I have been doing a lot of dishes lately that are baked to keep them healthier. This is a really good idea. These chicken strips look amazingly crispy! The photos are wonderful as well. One of my favorite TV snacks, ever! Yumm, honey mustard is another great dip! I only had barbecue sauce so that is what I used to dip these into. I’ve got chicken in the fridge and this will be on the menu tomorrow night! Can’t wait! Once I started making baked chicken tenders, the deep fried version just doesn’t satisfy my crave for crunch anymore. Such a better option all around! 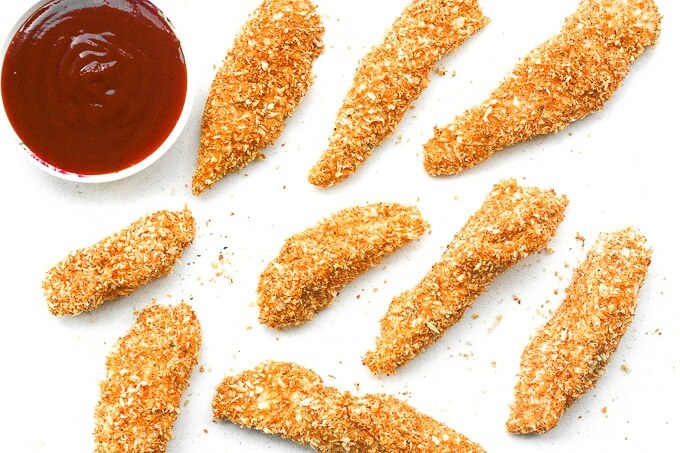 The crunchy panko on those strips is making my mouth water. I love that these are still so crispy while being so much healthier. This is a great option for our kids. YUM. My mouth is watering just looking at how crispy and golden these are! I am not ashamed to admit that I still have a soft spot for chicken strips, and these are making me hungry. (And I am so with you — panko all the way for crispy breading!) Pinning! You can never go wrong with Panko. I’m also a lover of chicken strips. Who wouldn’t be addicted to them?! Panko is kind of a miracle, isn’t it? Love your strips. They look sooo good. Thanks for sharing! This looks like it will be a standard meal for those nights with baseball games and we need something quick yet healthy. Yum… I can’t wait for dinner time so I can make these 😀 I love baked “fried” foods.. so much healthier and easier to make at home. I know, right? 🙂 Thanks for stopping by, Tina! I love crispy chicken! Especially with a side of ketchup! Yumm me too!! Barbeque sauce is my dip of choice 🙂 Ketchup is a close second! ooooh these look soooooooooo good! And way yummier than a restaurant, I definitely need to try these! Teenage and adult me would LOVE them! Baked is so much better for you than fried. The great thing about these tenders is the taste is still there but the healthy factor is up up up! I agree! It’s not worth having these deep-fried, when baked is just as good, if not better! I love crispy baked dippers! We do cauliflower all the time. And of course I am definitely not in a shortage of dipping sauces as I have so many I love and use. It’s the perfect easy meal! 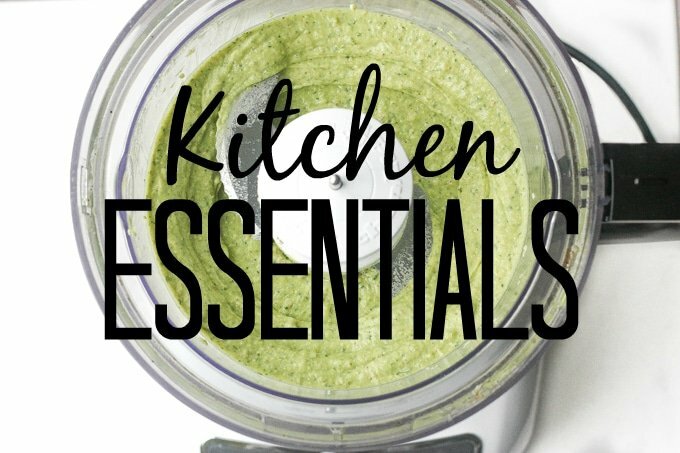 Subscribe now for your free eCookbook.